…which is not only the title of a song written and immortalized by the Beatles. It is also the conclusion reached by Yann Arthus-Bertrand, a photographer and documentary filmmaker, in his latest project, the results of which can be seen at the Senckenberg Museum in Frankfurt am Main until September 21. For what would you sacrifice your life? After analysis of the replies, Arthus-Bertrand’s realization was simple and not a little naïve sounding: That love, and love alone, is the solution to every problem; that individuals across the globe are connected by their innate need of human relationships. Family and children were unanimously perceived as something greater than oneself, as the stuff that gives meaning to life. Arthus-Bertrand was astounded by the variety of reactions he got from his questions. Many people confessed things they had never admitted to anyone before, things they could only admit to strangers. One old woman declared she wouldn’t change anything in her life. Except she would have married a different man. A crippled man in a wheel chair was happier since his paralysis than before. A black man said he had couldn’t remember a day without discrimination. All ya need is love, love is all ya need. I would have told you that, too – for free! All week the radio stations hyped the event. 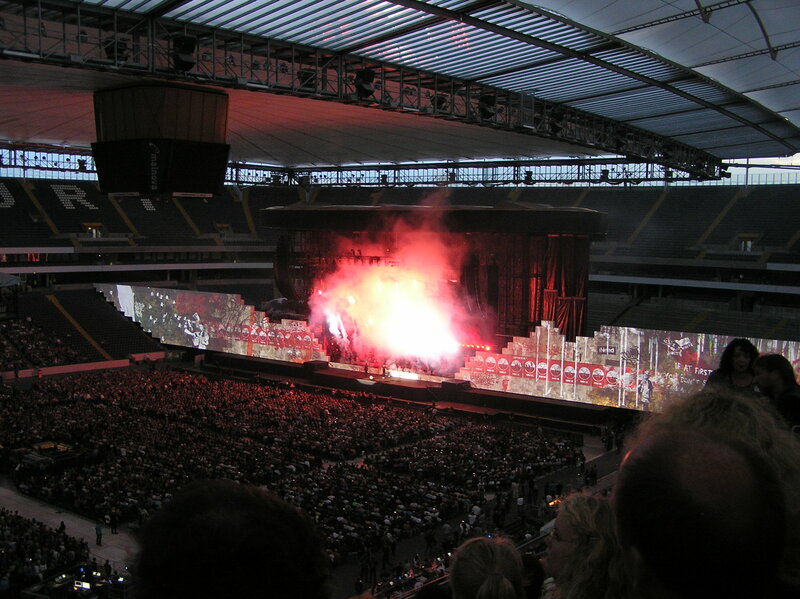 Last night it happened: Roger Waters and his crew staged a magnificent performance of THE WALL. The music was as powerful as when first released in 1979. 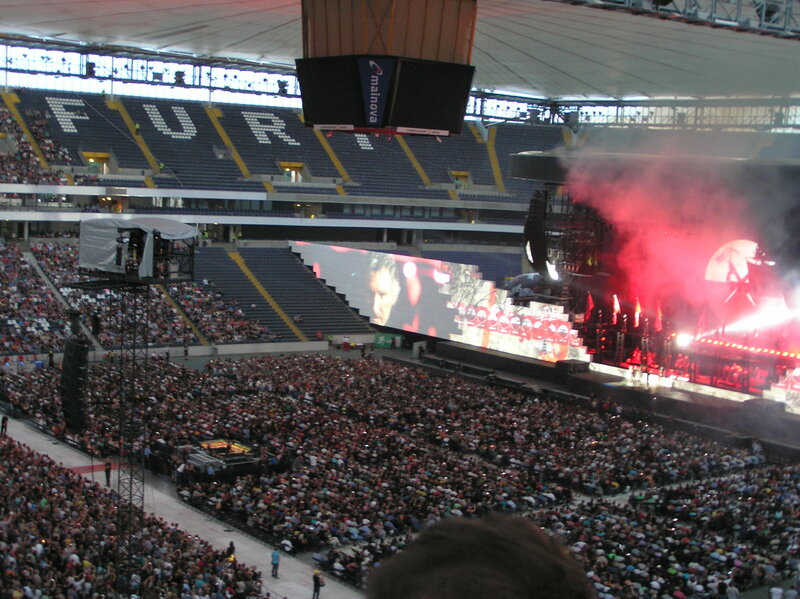 Live performances of the full-blown rock opera have been infrequent, thus making the Frankfurt gig a rare gem in the year’s schedule of big name appearances. The special effects – light, sound and visuals – were stunning. The droning airplanes and thwacking helicopters, the crashing bombs and the flak artillery, were not only loud. You felt them shake the arena; your internal organs vibrated along. They even flew a real airplane through the air to explode into the stage. With all this sound and fury, it must be noted that this is an anti-war message par excellance. Waters protests against the wanton destruction of individual human beings and their worlds with anger and irony. One bit of graffiti on the wall: “If at first you don’t succeed, call an airstrike.” Waters takes to task every element of our society responsible for causing war: the three big religions, political ideologies and big business. Symbols of these forces fall as payloads from bombers, causing death and destruction as they hit the ground. Behind the anti-war message lies Waters’ own private demons: the death of his father who he never knew in WWII, abuse by bullying teachers at school, an over-protective mother and his divorce. This statement on the wall, however, conveyed Roger Waters’ entire message to me in three words: FEAR BUILDS WALLS. I couldn’t help but think of my own small-scale, non-explosive creative efforts. In THE PEACE BRIDGE Hannah Zimmer fights to bring down the wall of silence that her family has built around the past. Fear built that wall, too. Like Hannah and Waters’ protagonist, Pink, we each have demons that haunt us and make us fear what we are walling in. Or walling out. Were you there last night? If so, what did you think? BTW: The performance deserves better photos! Sorry I couldn’t deliver.